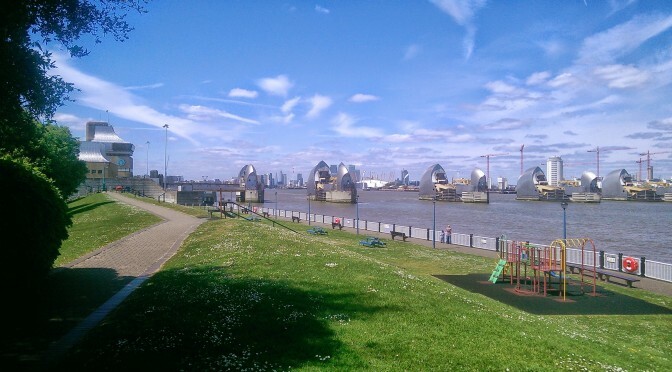 The second race of the 2015 London Park Race series takes place on Tuesday 9 June 2015 on the newly-mapped Maryon Park in Charlton near the Thames Barrier. Like all races in the series, the race is suitable for beginners. Full leg cover is not necessary; running in a T-shirt, shorts and trainers will be fine. Maryon Park is a new area for the London Park Race stretching from the River Thames at the Thames Barrier up into the wooded valleys and former pits that cut into the Greenwich Escarpment below Charlton village. There is landscaped parkland surrounding the Barrier, hilly, semi-open woodland in Maryon Park and Maryon Wilson Park and a small region of complex urban detail. The race is suitable for shorts and trainers and courses are planned to allow no significant advantage by running through undergrowth. The event centre is at the riverside Anchor and Hope on the Thames Path. The pub is an 800m walk from Charlton overground station with connections through Greenwich to London Bridge. It is 2.3km along the Thames Path from North Greenwich underground on the Jubilee line, or a ride on the 472 or 486 bus to Anchor & Hope Lane. Parking is unrestricted nearby on Riverside Walk and Anchor & Hope Lane. The pub kitchen normally closes before the race finishes, so they are going to prepare a curry for us. There will be vegetarian and non-vegetarian options and it will be served with rice, salad, samosa and bhaji. As this is cooked specially you’ll need to reserve your interest by Friday 5 June. The cost is £10, payable on the evening. Please email the organiser Ed Stott on or post on the Facebook event page if you would like to reserve food. Please note the slightly early than usual interval for start times, as the park is closed by Greenwich at 8pm. If you have any questions not addressed above, please email the series organiser Dan Findlay-Robinson at .